Summer may be 3 weeks away but apparently the heat arrived early to the party. Drippy, intense, wilting heat. I actually have a serious pet peeve with complaining about the weather but it is such a strong influence in our lives it’s hard not to talk about it! And plan my meals around it. Our kitchen is very small and not well insulated so the idea of standing over a hot burner to make dinner has been totally unappealing. Time to get creative with the grill! We do a lot of the usual grilled veggies, fish, shrimp, and tofu but lately I’ve been interested in exploring some more creative options for outdoor cooking. 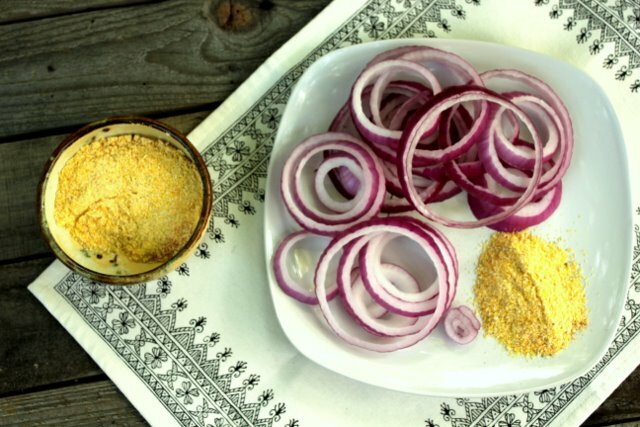 I used red, obviously, but a sweet onion like Vidalia would be great for this recipe too. The crust was a mix of course ground local cornmeal, rosemary salt, and smoked paprika. 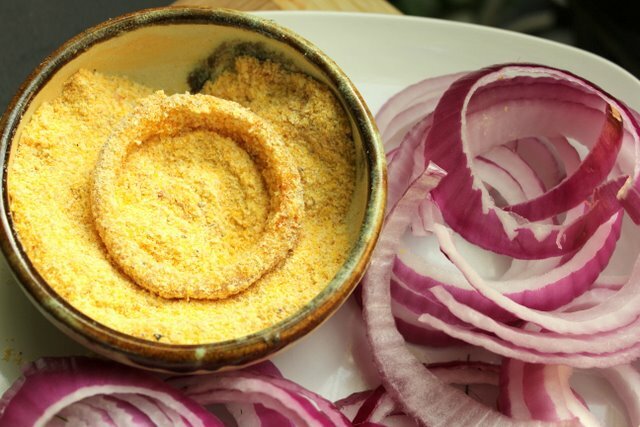 Each ring was dipped in an egg wash (1 beaten egg) then dredged with spiced cornmeal. And laid to grill over medium heat. 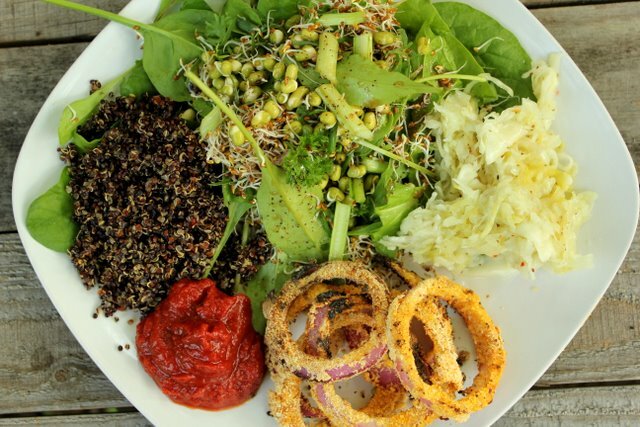 I served the crunchy rings with some homemade ketchup, garden picked salad, sauerkraut, and quinoa. 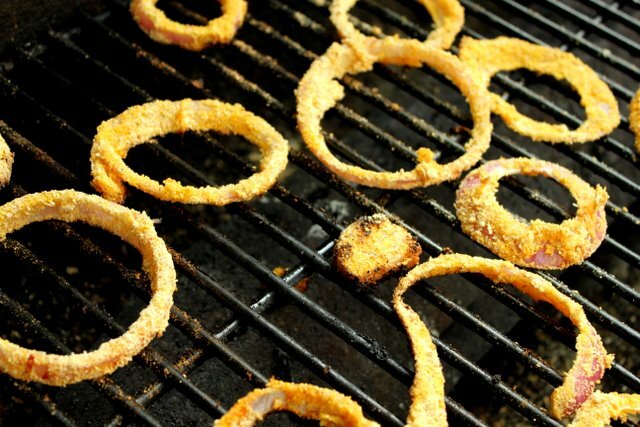 The onion rings were good but there is definitely room for improvement. Tate’s suggestion was to “cook them quickly in really hot oil”. Umm, not exactly what I am going for here. Next time I will use a finer cornmeal and spray them with a little olive oil before cooking. Dessert, however, hit it out of the park. 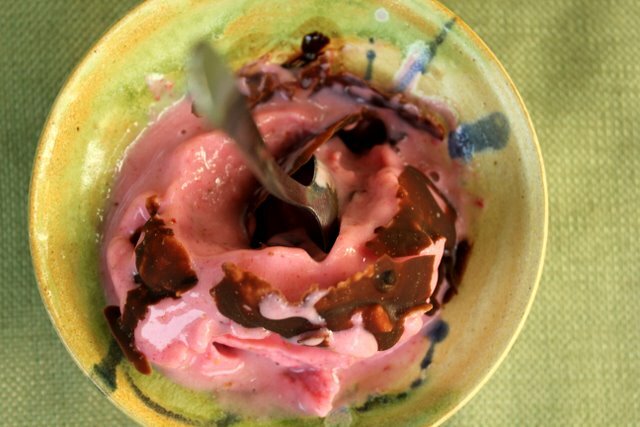 Organic frozen strawberries purred with a splash of soy-milk and topped with chocolate-coconut magic shell. My magic shell consisted of liquid coconut oil, a spoon of peanut butter, cocoa, stevia, and a splash of vanilla. I made a big batch (4 ounces?) and stored the leftover in a jar. Cannot wait to try it over purred frozen banana! I am still figuring out what my workout will be today, I don’t mind sweating but I find that a hard workout in this heat can be challenging to recover from. Time to slow down and enjoy a slow flow vinyasa! Maybe you could send a little heat my way? We could use a bit of warmth – although, it is supposed to get up to 22 degrees Celcius (72 F) today, so things are looking up! Love Tate’s suggestion – hilarious! Sometimes I’m a little slow, I responded “you mean deep frying?”. 72 sounds lovely! Enjoy! 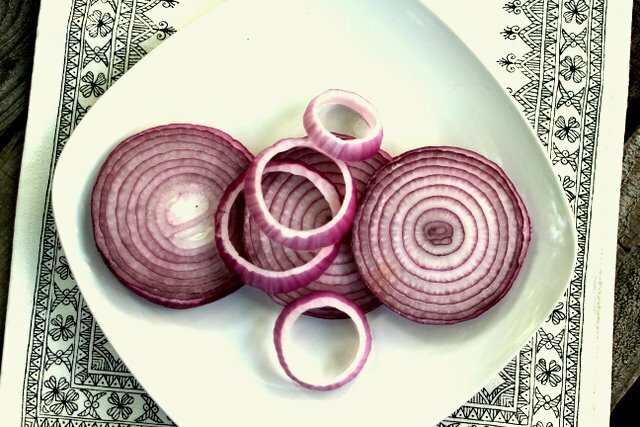 A VERY LONG time ago a New Orleans chef taught me how to make onion rings. She insisted that the secret was to use liberal amounts of Zatarains Cayenne Pepper. 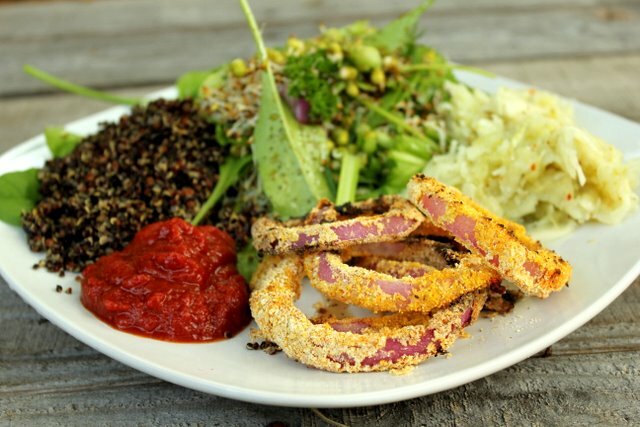 I can’t say that I use liberal amounts but I do use cayenne in mine and they aren’t bad. Some days I miss New Orleans. It was hot at my house last night (88*), so I did some “hot” yoga courtesy of an over heated, poorly insulated house with very few windows that open! The AC at our studio was broken yesterday and it was 92 for a 3pm yoga class! It’s great for nice, deep forward bends! 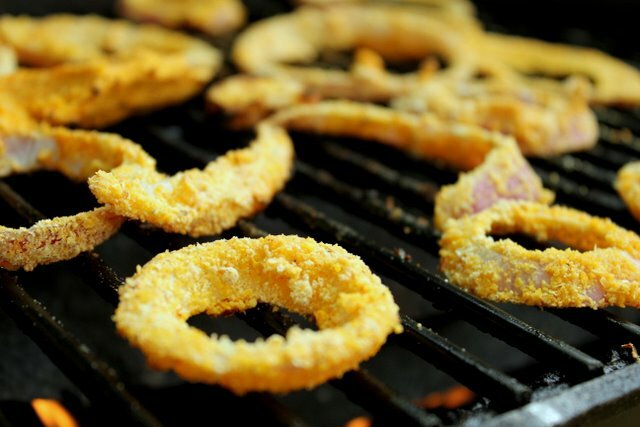 I laughed at Tate’s suggestion for the onion rings – my husband would have said the same. We’ve been fortunate in that it hasn’t gotten super hot yet (think 100’s plus), instead we’ve had sort of gloomy weather, with more rain than usual and colder than usual.